While Online Travel Agencies (OTAs) and hotels seem to be at odds with each other in today’s travel market, they both have one important thing in common: their dedication to the customer. In regards to online booking, there are important differences between how the two cater to their customers — differences that have helped OTAs seemingly dominate the online booking market. OTAs control over two-thirds of all online bookings, a number that is expected to keep climbing while hotels are trending in the opposite direction. Within the OTA market, the top brands include Expedia, Booking.com, and Priceline. These brands control 28.09%, 19.13%, and 16.15% of the market respectively. OTAs are showing no signs of slowing down, as it was predicted in 2017 that the Priceline Group, now named Booking Holdings, and Expedia will account for 94% of the online booking market by 2020. The top brands in the hotel market— Marriott International, Hilton Hotels, and IHG — control 26.21%, 17.25%, and 15.58% respectively. While overall hotels lost a small amount of their market share, Skift reports that the number of occupied rooms in 2017 were more than those in 2016— meaning, the volume of bookings has increased. This skew towards OTA online booking can be attributed to multiple factors. Compared to OTAs, hotels have limited control over their main operational costs, which include labour costs, debt services, franchise fees, utilities, real estate taxes and distribution costs. Even more, OTA’s increasing market share has caused hotel distribution costs to steadily rise over the last 5 years. Inherently, hotels have far less inventory than OTAs. As explained by Skift, this not only gives greater power to OTAs in marketing and online hotel sales but also increases their bargaining power. 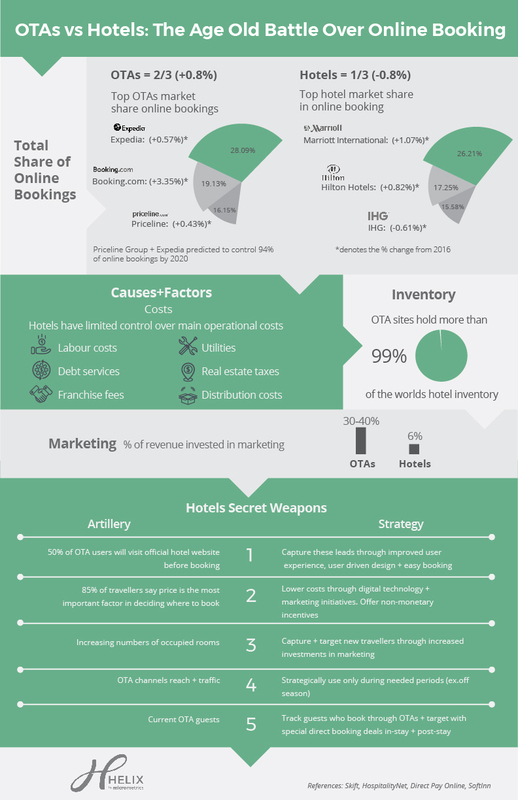 Hotels face a dilemma of complying with OTAs and losing market share, or not complying and losing even more. Lastly, OTAs invest significantly more in marketing initiatives than hotels. While OTAs typically invest 30-40% of their revenue in marketing efforts, hotels spend around 6%. This significant difference in resource allocation can partly explain why guests believe OTAs have cheaper prices, when in reality that’s simply what they’re more exposed to. That being said, hoteliers have a few unused tricks up their sleeves. For starters, 50% of OTA users will visit the official hotel website before booking. Hotels can better capture guests through improved user experience, user-driven design, and an emphasis on making the booking process as easy as possible. Within the hotel market, Wyndham saw the biggest market share gains, tripling its market share since last year. Their achievement can be attributed to their success in catching OTA users and converting them before they leave the site. To do so, Wyndham improved their website by prioritizing guest experience and improved the Wyndham Rewards app’s usability. The overwhelming majority of travelers (85%) say price is the most important factor when deciding where to book— and associate lower prices with OTAs. Hoteliers can combat some of their operational costs, and consequently have more flexibility with pricing, through investing in digital technology. Moreover, through increasing their marketing initiatives and offering additional non-monetary incentives, hoteliers can better compete with OTAs on travelers perceptions of price. Barry Goldstein, Wyndham Hotel Group’s chief marketing officer, revealed that one of the major factors of Wyndham’s success was their shift to an “intense focus on technology”. Wyndham also leveraged travelers price sensitivity by consistently offering discounts to guests who book direct, and through implementing a summer travel message that highlights price. Increasing numbers of occupied rooms show that hoteliers have the opportunity to increase their number of direct bookings. Hoteliers should focus on capturing and targeting guests through increased investments in marketing. Since 2015, Wyndham has increased their marketing initiatives and placed within the top 10 largest hotel advertisers on US television, spending over $19 million. Considering the reach and traffic that OTAs generate daily, hoteliers should strategically use OTA channels only during needed periods, like during off seasons. Even more, hotels should track guests who book through OTAs and target them with special direct booking deals during their stay and after they check-out. It’s finally time for the age-old battle between OTAs and hotels to end— and with a little refinement hoteliers may just come out on top. Find out how the Holiday Inn Colchester Improved Their Problem Resolution Scores by 50%!